Combine and cook for 15 minutes on a low flame. Remove the mushroom stems. Place the mushrooms stems, salt, tomato paste, brown sugar and coffee or espresso and soy sauce in 2 liters of water and cook on high heat until reduced to 1 cup. Strain and discard mushrooms stems. Cool stock. Slice the mushrooms caps into 3-4 pieces vertically. Heat oil in a large skillet. Add the onions and stir until soft and begin to caramelise to a golden brown. The caramelised onions will bring rich flavour to the ribs. Add garlic and remaining mushrooms. Saute until water evaporates and mushrooms start to brown. Switch off flame. Cool mixture. Blitz to cooled mushroom mixture to a paste in the blender. Add ketchup, peanut butter and blitz again. In a mixing bowl combine the wheat gluten and mushroom paste. Slowly add the mushroom stock as required to form a thick loose dough. Spread the dough in the oiled pan. Bake in a preheated oven for 30-40 minutes in the middle rack until set but not hard. Remove and using a sharp knife cut into sizes desired. Cool in the pan. Remove only once the dough is at room temperature. Heat more vegetable oil in a grill pan and grill each piece until grill marks for on either side. 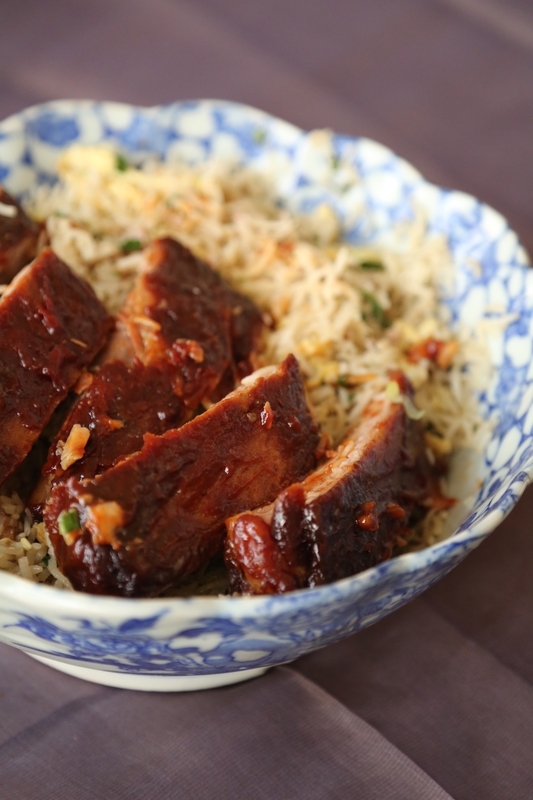 Slather with more bbq sauce and serve with fried rice or noodles. Minestrone is Italy's most famous soup and it has become popular because its easy to make, adaptable and delicious. Over the centuries Minestrone in Italy has changed a great deal. Tomatoes for instance as a newer addition to the soup. Traditionally minestrone is made with Borlotti beans also known as cranberry beans but they are not always available, Here is my version, which uses ingredients that you can find anywhere. This recipe can be made with bacon or you can use dried mushrooms (as indicated below) for a vegetarian version that is scrumptious. 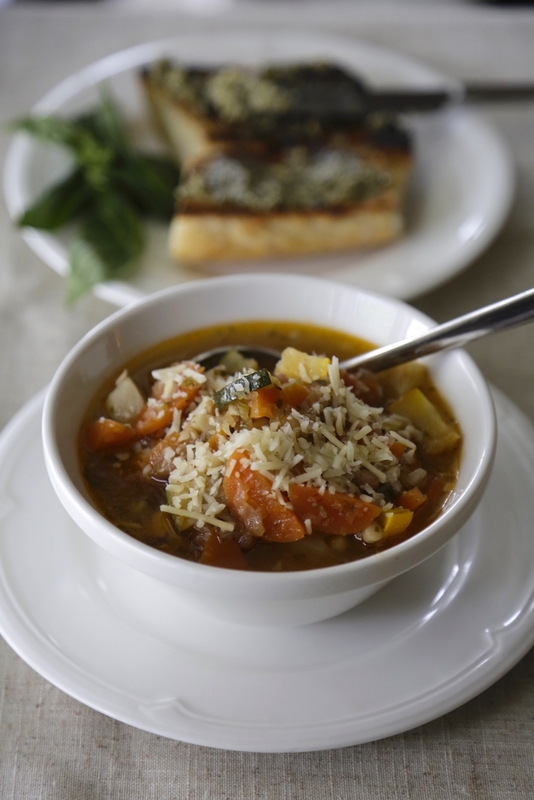 I serve it with a pesto bruschetta reminiscent of the Ligurian version of this soup known as Minestrone all Genovese. But garlic bread is great too. I used Fregola- a toasted semolina pasta in this soup. 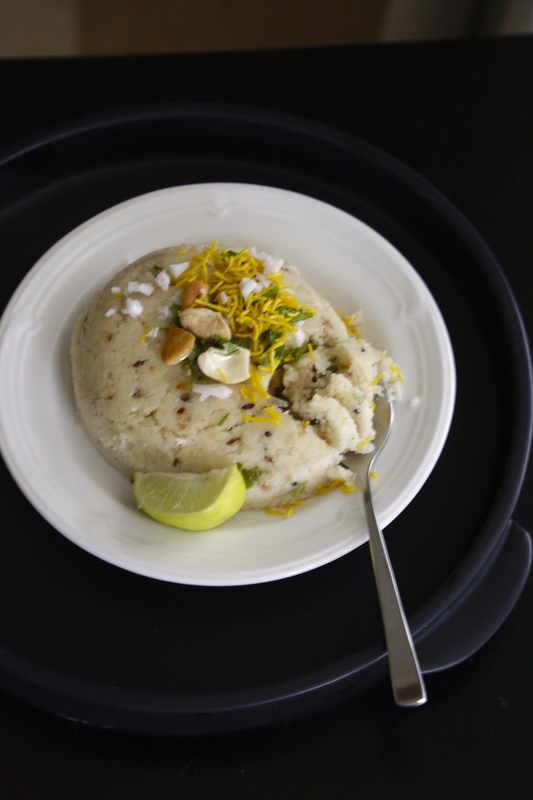 You can use barley instead if you want a gluten-free version. IF MAKING VEGETARIAN MINESTRONE SOAK THE DRIED MUSHROOMS IN 1/2 CUP HOT WATER. HEAT OIL ON MEDIUM HEAT IN A LARGE SOUP POT. ADD BACON AND COOK UNTIL GOLDEN AND RENDERED. IF VEGETARIAN SKIP THIS STEP. ADD ONIONS AND CELERY AND SAUTE UNTIL ONIONS ARE SOFT AND TRANSLUCENT-3-4 MINUTES. ADD POTATOES AND STIR WELL. ADD 1.5 LITERS OF WATER, GROUND PEPPER AND COOK 5-7 MINUTES UNTIL POTATOES SOFTEN. ADD CARROTS AND COOK ANOTHER 4 MINUTES UNTIL CARROTS SOFTEN. ADD BEANS, AND COURGETTES AND THE MUSHROOMS WITH THEIR LIQUID (IF USING) AND COOK 2 MINUTES ON HIGH HEAT UNTIL THE SOUP BEGINS TO BOIL. ADD PASTA AND SWITCH OFF THE FLAME. ALLOW THE PASTA TO COOK IN THE HEAT OF THE SOUP. ADD SALT AND MORE PEPPER TO TASTE. LADLE INTO BOWLS. PROCESS THE INGREDIENTS TO A CHUNKY CONSISTENCY IN A FOOD PROCESSOR. FLAME THE SOURDOUGH OR BAGUETTE OVER AN OPEN FLAME ON BOTH SIDES. IMMEDIATELY BRUSH WITH PESTO BUTTER AND SERVE WITH HOT MINESTRONE AND MORE PARMESAN ON THE SIDE. There is nothing most classic and comforting than a roast chicken dinner. To cook a roast chicken that has a golden crispy skin and a fully cooked but moist inside make sure the oven is preheated when the chicken goes in. I like to cook mine at a low temperature for the first 35 minutes and then increase the temperature towards the end. 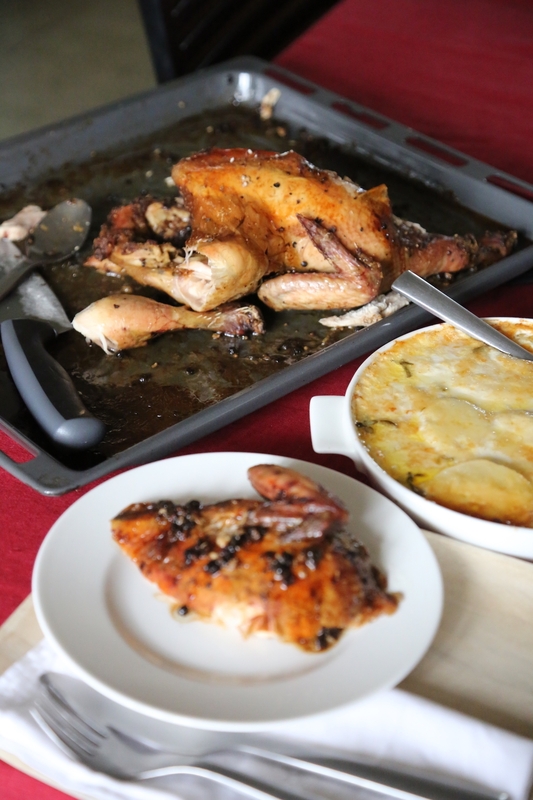 I recommend serving this chicken with Pommes Dauphinoise Gratin and a simple green salad. In a small saucepan melt the vinegar, butter and oil over a slow flame. Whisk to emulsify. Do not boil this. Remove from flame and cool. If you have washed the chicken wipe it dry with paper towels. Tuck the wings under the sides.and truss (Tie together) the chicken legs with some kitchen string. Using a pastry brush or a spoon coat the chicken with the vinegar mixture. Use your fingers to apply this to the inside of the skin. Push 3 smashed garlic cloves into the chicken cavity. Rub the remaining over the chicken and tuck inside the skin. Coat the top of the chicken with the crushed black pepper. Remove the chicken from the fridge and let sit 10 minutes. Preheat oven to 325F nd prepare bottom rung. Roast chicken for 45 minutes for a 1.5 kg chicken and ten minutes less for a 1.25 kg in the lower rung. Move chicken to the middle rung. Using a tablespoon or a basting brush brush the juices at the bottom of the pan all over the chicken. and increase the temperature to 400F. Cook until the chicken skin in golden brown. Remove from the oven and let rest 15 minutes before serving. This is important to allow the meat to rest and the juices to settle before you carve it. Remove the chicken from the pan onto your carving plate and strain any remaining liquid into a gravy dish.Discard bits unless there are pieces of garlic. Keep those -they are yummy. Serve the jus on the side. 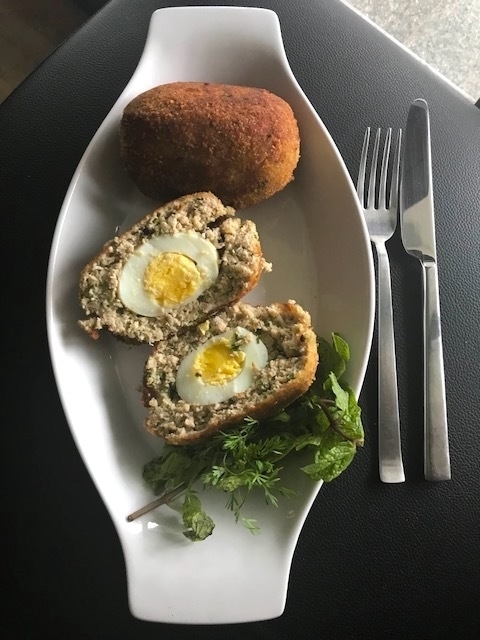 It is said the British took the recipe for Nargisi Kofte and turned it into bland Scotch eggs, a hardboiled egg encased with chicken or lamb mince. 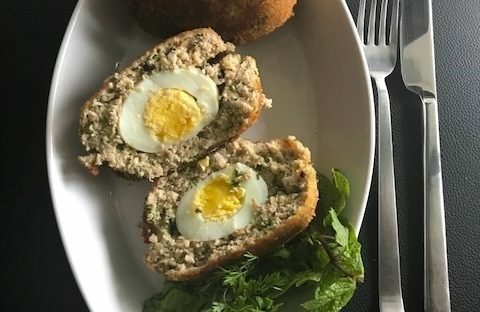 My grandmother's version of Scotch eggs was anything but bland. She cooked the meat with onions and spices and served the Scotch eggs with a spicy mayonnaise, French fries and steamed vegetables. She always used lamb mince. I prefer chicken because it cooks faster and leaves the egg inside softer. Drain the water from the minced meat in a fine sieve. Squeeze it several times to drain out any excess water. Heat oil in a large deep skillet on medium heat. Add the bay leaf, cloves and peppercorn and saute 1-2 minutes until fragrant. Add the onions and green chillies and cook till soft and opaque. Add garlic and ginger paste and cook 1-2 minutes stirring constantly. Add the minced meat and stir well. Lower flame and cook until meat is almost cooked through and most of the water has evaporated. Cool completely. Add salt to taste. Process meat in a grinder or food processor with the cooked spice until coarse but well combined. Do not turn into a paste. The meat should have some texture. Stir in chopped herbs, yolk and processed bread. Combine well. Place one portion on the palm of your hand and flatten it. Place the egg over it and bring the sides together. Rest on a plate. Take the second portion and flatten it on your palm. Lift the half covered egg and place the uncovered side into the minced meat in your palm. Bring the sides together to completely cover the egg. Do not press too hard or you may damaged the soft boiled egg. Shape gently to look like an oval. Dip this patty into the whisked eggs. Pat onto the breadcrumbs until all sides are covered. Repeat the egg wash and dip into breadcrumbs again. Do this with the remaining 3 patties. Heat 2 inches of oil in a deep non-stick skillet. When the oil is hot but not smoking fry the eggs until all sides are a deep golden brown. Drain and serve immediately with suggested sides and spicy mayo. This velvety pasta is a knockout and so easy to make. Serve it with a crispy salad and an easy bottle of red wine. Set a stock pot of water with a pinch of salt to boil. Heat butter an olive oil in a large and deep skillet. Add the pears and cook on a medium flame until pears begin to caramelise. Add 2 cups of the pasta stock water to the pan. Stir in the blue cheese and when it is melted and you have a smooth sauce drain the pasta and toss the noodles in the sauce. Add a teaspoon of salt and season with fresh pepper. 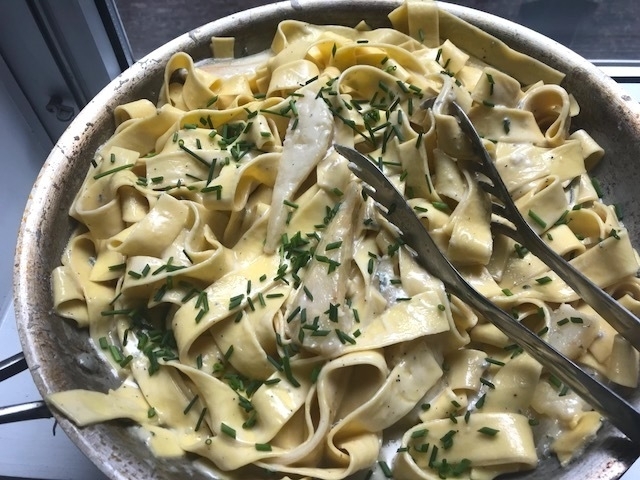 Stir in the cream and garnish with chives, Serve hot. This is a classic blue cheese dressing I make all the time because it is easy and delicious.Literally blitz the ingredients in a mixer and you are done. Blue cheese dressing is an American creation. Litehouse, an American company claims to be the first to have bottled and sold this dressing 60 years ago. I have as yet to find the original source for the blue cheese dressing recipe. Some say it was Fannie Merritt May in the Boston Cooking School Cookbook first published in 1896. I looked up my 1905 copy and found 2 recipes with Roquefort but they are not blue cheese dressing. Many folks think of blue cheese as a 'stinky' cheese because it is treated with a mold called Penicullum, which gives it the characteristic blue and white veining and the sharp taste. But not all blue cheese are malodorous. Infact many of the best known blue cheeses such as Danish Blu and Gorgonzola are mild. And there are many Bries, Gruyere and other cheeses for instance the Époisses de Bourgogne and the Ouleout that are far more pungent than most blue cheese I've ever had. Cheeses with washed rinds that have been treated with alcohol, water, ash even and aged for long periods allow for yeast to grow and can make the product very strong smelling. Often the smell comes from the rind of the cheese, while the edible part inside remains delicately flavored. So the poor blue cheese gets a bad reputation it doesn't deserve among those who don't like bold flavours. 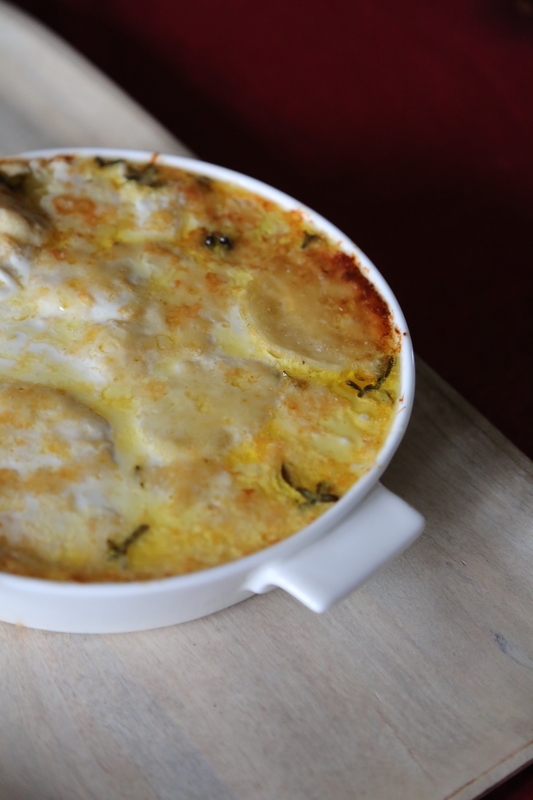 Blue cheese has Umami and used correctly can really lift the flavour of a dish. So even if you don't enjoy eating it as a cheese, consider it in dishes like pastas, salads, fondues. Don't dismiss it- you could be missing out on something wonderful. The smelly factor and the price can really vary depending on the kind of blue cheese you use. Blue cheese is made with many different kinds of milk- pasteurised and unpasteurized, (sheep, cow, goat) and can be firm like the Norwegian Gamalost or the English Dorset Vinney, semi-hard like Picón Bejes-Tresviso, semi soft like Danish blue and soft like Oxford Blue and Dovedale. For this dressing you need a semi soft crumbly cheese, preferably one without a rind like the American made Maytag blu (a personal favourite for eating and cooking) Gorgonzola or Danish Blue are good choices. If you are doing a pasta with blue cheese or a fondue you could consider an even softer cheese like the Bavarian Cambozola that will melt easily into the sauce. For a cheese plate you can pair slightly harder blue cheese like Stilton with pears, apples, quince and honey. Gorgonzola, considered the oldest of blue cheeses dating back to the 9th century A.D. is Italian and made from cows or goats milk, sometimes both and Roquefort- the King of French cheese is made from ewe's milk. Roquefort is a sharp cheese, Gorgonzola is less so. An aged St Agur or the Spanish Cabrales can be even sharper. Blue cheeses are produced by many different countries though Roquefort was the first cheese in France in 1925 to receive the Appellation D'Origin, which means it can only be called Roquefort if it is aged in specific caves, the milk comes from a specific breed, even the Pencillum mold known as Roqueforti must come from the caves of the Roquefort sur Soulzon. For a blue cheese dressing to work it must have just enough blue cheese in it to give it a kick. So depending on the strength of the cheese you use add more or less to your taste. Traditionally blue cheese dressing, an American creation is a thick and creamy dressing. If you want a lower fat version of this I have a blue cheese vinaigrette recipe in my cookbook #anindiansenseofsalad available in bookshops and online. Blue cheese dressing is also delicious with buffalo chicken, bacon, apples, pears, honey, quince, chocolate, port, ales, pecans and spinach. 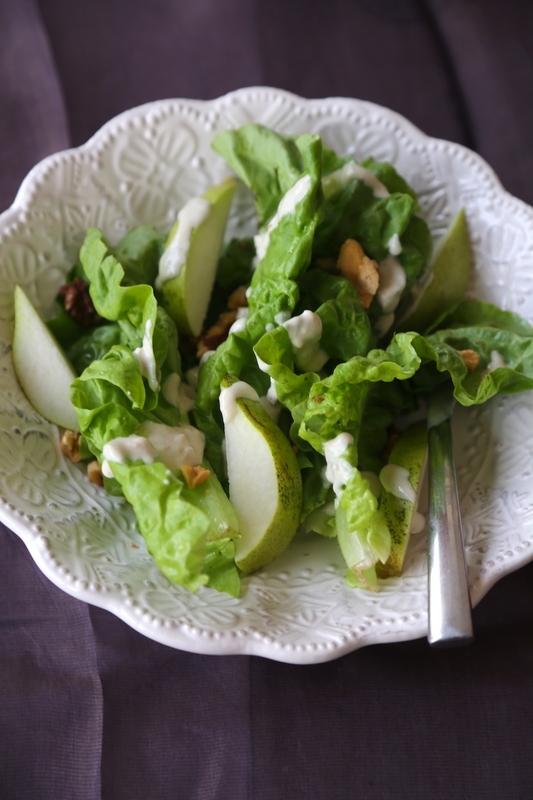 If you can't find butter lettuce use romaine or iceberg. If you want a milder, less sharp sweeter blue, look for a young and preferably without rind blue cheese- though there are always exceptions. When you first open a blue cheese you get a sharp whiff of ammonia. This can be off-putting but wait 5 minutes, let the cheese breathe and slowly its complex and nutty aromas will emerge. Blue cheese doesn't freeze well and should be consumed in 7-8 days. If your cheese smells of acetone or is sticky and pink, jettison it tout de suite. Many famous American blue cheeses were actually created in University labs like Maytag in 1941 in Iowa and Clemson blue by the College of South Carolina. Before Wang discovered penicillin cheese was used in medieval Europe to control gangrene. COMBINE THE ONIONS AND WHITE VINEGAR AND LET SIT 30 MINUTES IN THE FRIDGE. BLEND ALL THE INGREDIENTS FOR THE DRESSING IN FOOD PROCESSOR. MANUALLY STIR IN THE CRUMBLED BLUE CHEESE AND ONIONS WITH A WHISK OR FORK. ADD SALT TO TASTE. ADJUST FOR SUGAR AND VINEGAR. KEEP COVERED AND REFRIGERATED FOR UPTO 48 HOURS. PREPARE THE LETTUCE FOR THE SALAD. REMOVE THE STALKS WITH A SHARP KNIFE AND USING YOUR HANDS TEARS THE LEAVES APART ONE BY ONE. DIIVIDE UP BETWEEN 6 BOWLS. DIVIDE THE PEARS AND THE WALNUTS BETWEEN THE BOWLS. SERVE THE DRESSING ON THE SIDE.